A primary reason that Hell must be eternal is that the only condition that matters to man is the present condition. But the real reason why Hell is eternal is because at death the will will be fixed for eternity. "It is because our wills" a lost soul said "were fixed for eternity at the moment of death. We had made our final choice. Our obstinacy will never leave us." (Cry of a Lost Soul). Thus, the damned will never repent and will never cease to hate God and will never seek forgiveness for their sins even if it were granted to them, "because he [the soul] was rejected by Him [God], such a person cannot but hate Him with all the strength of his wicked will. We died with willful resolve to be separated from God. Do you now understand why hell lasts forever!" (Cry of a Lost Soul). This is the real reason why Hell must be eternal. Seventh-day Adventists believe that the wicked will be punished in the lake of fire, before ultimately being destroyed. Their reading of biblical texts that are used in support of the traditional doctrine of hell is that these texts can be harmonized with this particular annihilationist understanding of hell. The Seventh-day Adventist view is that these biblical texts refer to the destructive forces that are employed and the results of this punishment as being eternal, and not that the wicked specifically experience conscious torment throughout eternity. Cecil Perry, president of the Seventh-day Adventists in England, issued a warning that Hell should not be preached. He was responding to a report issued in April 2000 by the Evangelical Alliance of the United Kingdom that describes Hell as a physical place that is occupied by unrepentant sinners. Perry took issue with that, saying, "The message of hell is in stark contrast to the message of hope and love and tends to engender fear" ("British Seventh-day Adventists Warn Against 'Stoking' Hell Fires," Religious News Service, April 2000). Ellen G. White too rejected the eternal hell and immortal soul concept as can be seen in her book. Ellen White, The Great Controversy: "How repugnant to every emotion of love and mercy, and even to our sense of justice, is the doctrine that the wicked dead are tormented with fire and brimstone in an eternally burning hell. . . . And how utterly revolting is the belief that as soon as the breath leaves the body the soul of the impenitent is consigned to the flames of hell! ... the doctrine of natural immortality first borrowed from pagan philosophy, and in the darkness of the great apostasy incorporated into the Christian faith, has supplanted the truth. . . . The theory of eternal torment is one of the false doctrines that constitute the wine of the abomination of Babylon. . . . But those who have not, through repentance and faith, secured pardon, must receive the penalty of transgression ... covered with infamy, they sink into hopeless, eternal oblivion. . . . There will then be no lost souls to blaspheme God as they writhe in never- ending torment; no wretched beings in hell will mingle their shrieks with the songs of the saved" (The Great Controversy, pp. 469, 470, 477, 478, 483)." Regardless of whether it rubs uncomfortably against human reason, the Bible teaches that the unsaved must endure eternal conscious torment. Proof for this is found in Matthew 25:46, in which eternal life is compared to eternal punishment in duration and state. "And these shall go away into everlasting punishment: but the righteous unto life eternal." There are over thirty repeated references to the existence of Hell in the Old Testament alone. For instance: "The sorrows of death have compassed me: and the perils of hell have found me" (Psalms [D-R] 114:3). "For the Lord Almighty will take revenge on them. In the day of judgment he will visit them: for he will give fire and worms into their flesh, that they may burn, and may feel for ever" (Judith 16:20 -21). "Depart from me, come not near me, because thou art unclean: these shall be smoke in my anger, a fire burning all the day" (Isaias 65:5). "A fire is kindled in my wrath, and shall burn even to the lowest hell...I will heap evils upon the transgressors of my law, and will spend my arrows among them" (Deut. 32:22-23). "The congregation of sinners is like tow heaped together, and the end of them is a flame of fire" (Ecclesiasticus 21:10). "He shall be punished for all he did, and yet shall not be consumed:...he shall burn, and every sorrow shall fall upon him...All darkness is hid in his secret places: a fire that is not kindled shall devour him" (Job 20:18,22,26). In Chapter 16 of the Gospel of St. Luke, Jesus tells a parable on Hell. A rich man who has died and is in Hell pleads with God to send the poor man Lazarus, who has gone to Heaven (or Abraham's bosom), back from the dead to warn his five brothers that Hell really exists. God replies: "If they will not listen to Moses and the prophets, neither will they be persuaded if someone should rise from the dead." However, God is so merciful that He has allowed certain of the damned in Hell to return to earth to witness to others that there truly is a place of eternal suffering – Hell – for those who disobey God and His commandments. We will look at some of these apparitions at the end of this article. To deny the eternity of Hell is a condemned heresy and is simply said to deny the Bible. There is at least one main reason why Hell must be eternal. That the pains of Hell are eternal is, of course, part of the faith. Jesus makes that quite clear in numerous places (Mt. 25:41; Mark 9:44). It's dogmatically reaffirmed by the Catholic Church. Even though people know that it's taught in the Bible, many are still deeply disturbed by the consideration of this mind-boggling truth. They wonder how such an unimaginable punishment could be just. In response many will bring up the idea that an offense against Infinite Majesty (God) deserves infinite punishment. However, we would like to consider this issue from another angle. The following is simply our quick take on why it makes perfect sense that the pains of Hell are eternal. However, regarding the argument that the only condition that matters to man is the present condition. For instance, suppose you live in a frigid area of the world. Suppose that you had heat for the past ten years, but this year catastrophe has struck your area and left you without any heat in the depths of winter. You are freezing, shivering, etc. Will the fact that you had heat for the last ten years make you happy while you are freezing this winter? No. It won't help you at all. All that matters is that you don't have heat this winter. It's true to say that all that matters to you is your present condition. Likewise, suppose that you did not have heat for the past ten years, but finally got it this year. Will the fact that you did not have heat last year, and the year before, etc. make you unhappy while you sit comfortably and warmly now? No. All that matters is that you are warm and comfortable now. All that matters is your present condition. The same truth applies to everything, including to the passing pleasures desired by worldly people. (It must be pointed out that none of these passing pleasures can bring true happiness, for man was created for God and can only be fulfilled in Him. But the point holds true for these matters as well.) For instance, those who glory in their present state of great fame or great wealth or great success or great beauty are not troubled by the fact that they did not possess this ten or twenty years ago. All that matters to them is that they are famous or successful or wealthy, etc. now. All that matters to man is the present condition. Therefore, if the pains of Hell did end at some point, then at that very point the condition of the person would be free of punishment. He would suffer no pain at all. Since all that matters to man is the present condition, the end result would be that man would not be punished at all. Thus, when it is considered deeply, it is true to say that a punishment that is not eternal is, in the end, actually no real punishment at all. For if it ends at any point, then the final condition of man (which is all that will matter to him) is one without punishment. 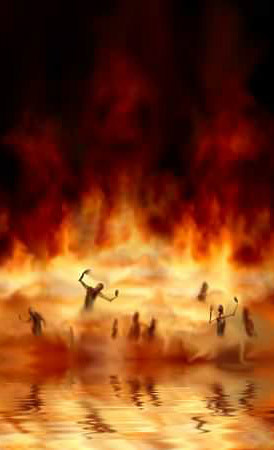 As said before, God is so merciful that He has allowed certain of the damned in Hell to return to earth to witness to others that there truly is a place of eternal suffering – Hell – for those who disobey God and His commandments. The following are a few examples of many such occurrences – documented in the annals of private revelation. "I saw several souls fall into Hell, and among them was a child of fifteen, cursing her parents for not having taught her to fear God nor that there was a Hell. Her life had been a short one, she said, but full of sin, for she had given in to all that her body and passions demanded in the way of satisfaction... [all must of course understand that masturbation (also in marriage) is a mortal sin that will damn an unrepentant soul or couple to eternal Hell]" (March 22, 1923). "Sophia made a full confession of her activities to the police," Father Macchi said. "But so far nothing has come of it because she is living the life of a model citizen. She has given her money to charity and lives in a tiny apartment right next door to my church. She is a woman who truly [or apparently so, and so we hope] has found God – and probably just in the nick of time." Dear fellow Christians, Father Lombardi, in his public debate with Italian Communist leader Velio Spano in Cagliara on December 4, 1948, stated, "I am horror-struck at the thought that if you continue in this manner, you will be condemned to hell." Spano replied, "I do not believe in hell." Father Lombardi replied, "Precisely, and if you continue, you will be condemned; for to avoid being condemned, one must believe in hell." Hell is a grave reality that is easily forgotten in today's Godless and apathetic society. This is all the more reason why we should fear for our salvation and do all that we can to make sure that we are one of the elect. St. Leonard of Port Maurice said, "To be saved for all eternity, to be damned for all eternity, and to not make your every effort to avoid the one and make sure of the other, is something inconceivable." Do not let your life pass before it is too late; focus on saving your soul to the exclusion of all other unnecessary things, lest you find yourself forever in the eternal fires after your judgment. To deny the eternity of Hell is heresy and is simply said to deny the Bible.